Definition at line 1204 of file winddi.h. Definition at line 1210 of file winddi.h. Referenced by BITMAP_CopyBitmap(), BITMAP_GetObject(), and NtGdiCreateBitmap(). Definition at line 1207 of file winddi.h. Definition at line 1205 of file winddi.h. Referenced by DoDeviceSync(), EngCreateDeviceBitmap(), EngCreateDeviceSurface(), and EngModifySurface(). Definition at line 1217 of file winddi.h. 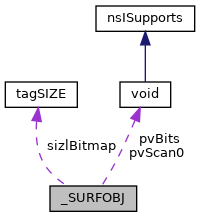 Referenced by BITMAP_CopyBitmap(), GreGetDIBitsInternal(), and SURFACE_vCleanup(). Definition at line 1208 of file winddi.h. Referenced by DbgDrvCopyBits(), DC_bIsBitmapCompatible(), DoDeviceSync(), EBRUSHOBJ_bRealizeBrush(), EBRUSHOBJ_psoMask(), EngAssociateSurface(), IntCreateCompatibleBitmap(), IntEngBitBlt(), and PDEVOBJ_vSwitchPdev(). Definition at line 1206 of file winddi.h. Referenced by EngCreateBitmap(), EngCreateDeviceBitmap(), EngCreateDeviceSurface(), GreCreateBitmapEx(), NtGdiCreateBitmap(), NtGdiDdDDICreateDCFromMemory(), and SURFACE_AllocSurface(). Definition at line 1215 of file winddi.h. Referenced by addItemFlood(), AlphaBltMask(), BITMAP_CopyBitmap(), BITMAP_GetObject(), BltMask(), BltPatCopy(), CallDibBitBlt(), CallDibStretchBlt(), DC_bIsBitmapCompatible(), DIB_16BPP_BitBltSrcCopy(), DIB_1BPP_BitBltSrcCopy(), DIB_24BPP_BitBltSrcCopy(), DIB_32BPP_BitBltSrcCopy(), DIB_4BPP_BitBltSrcCopy(), DIB_8BPP_BitBltSrcCopy(), DIB_XXBPP_AlphaBlend(), DIB_XXBPP_FloodFillSolid(), DIB_XXBPP_StretchBlt(), EBRUSHOBJ_psoMask(), EngAlphaBlend(), EngLineTo(), EngRealizeBrush(), EngTransparentBlt(), GreGetDIBitsInternal(), IntEngEnter(), IntEngGradientFillRect(), NEtoSW(), NtGdiGetBitmapBits(), NtGdiSetBitmapBits(), NWtoSE(), SEtoNW(), SWtoNE(), TranslateCOLORREF(), UnsafeGetBitmapBits(), and UserDrawIconEx(). Definition at line 1216 of file winddi.h. Referenced by GreGetSetColorTable(), IntEngEnter(), and SURFACE_vCleanup(). Definition at line 1214 of file winddi.h. Definition at line 1213 of file winddi.h. Referenced by BITMAP_CopyBitmap(), DIB_16BPP_BitBltSrcCopy(), DIB_16BPP_ColorFill(), DIB_16BPP_GetPixel(), DIB_16BPP_HLine(), DIB_16BPP_PutPixel(), DIB_16BPP_TransparentBlt(), DIB_16BPP_VLine(), DIB_1BPP_BitBlt(), DIB_1BPP_BitBltSrcCopy_From1BPP(), DIB_1BPP_GetPixel(), DIB_1BPP_PutPixel(), DIB_24BPP_AlphaBlend(), DIB_24BPP_BitBlt(), DIB_24BPP_BitBltSrcCopy(), DIB_24BPP_ColorFill(), DIB_24BPP_GetPixel(), DIB_24BPP_HLine(), DIB_24BPP_PutPixel(), DIB_24BPP_TransparentBlt(), DIB_24BPP_VLine(), DIB_32BPP_AlphaBlend(), DIB_32BPP_BitBltSrcCopy(), DIB_32BPP_GetPixel(), DIB_32BPP_HLine(), DIB_32BPP_PutPixel(), DIB_32BPP_TransparentBlt(), DIB_32BPP_VLine(), DIB_4BPP_BitBlt(), DIB_4BPP_BitBltSrcCopy(), DIB_4BPP_GetPixel(), DIB_4BPP_HLine(), DIB_4BPP_PutPixel(), DIB_4BPP_VLine(), DIB_8BPP_BitBltSrcCopy(), DIB_8BPP_GetPixel(), DIB_8BPP_HLine(), DIB_8BPP_PutPixel(), DIB_8BPP_TransparentBlt(), DIB_8BPP_VLine(), IntEngEnter(), and UnsafeGetBitmapBits(). Definition at line 1211 of file winddi.h. Referenced by BITMAP_CopyBitmap(), BITMAP_GetObject(), GreCreateBitmapEx(), IntGdiCreateMaskFromRLE(), NtGdiCreateBitmap(), and SURFACE_vCleanup(). Definition at line 1212 of file winddi.h. Referenced by DIB_16BPP_BitBltSrcCopy(), DIB_16BPP_ColorFill(), DIB_16BPP_GetPixel(), DIB_16BPP_HLine(), DIB_16BPP_PutPixel(), DIB_16BPP_TransparentBlt(), DIB_16BPP_VLine(), DIB_1BPP_BitBlt(), DIB_1BPP_BitBltSrcCopy_From1BPP(), DIB_1BPP_GetPixel(), DIB_1BPP_PutPixel(), DIB_24BPP_AlphaBlend(), DIB_24BPP_BitBlt(), DIB_24BPP_BitBltSrcCopy(), DIB_24BPP_ColorFill(), DIB_24BPP_GetPixel(), DIB_24BPP_HLine(), DIB_24BPP_PutPixel(), DIB_24BPP_TransparentBlt(), DIB_24BPP_VLine(), DIB_32BPP_AlphaBlend(), DIB_32BPP_BitBltSrcCopy(), DIB_32BPP_GetPixel(), DIB_32BPP_HLine(), DIB_32BPP_PutPixel(), DIB_32BPP_TransparentBlt(), DIB_32BPP_VLine(), DIB_4BPP_BitBlt(), DIB_4BPP_BitBltSrcCopy(), DIB_4BPP_GetPixel(), DIB_4BPP_HLine(), DIB_4BPP_PutPixel(), DIB_4BPP_VLine(), DIB_8BPP_BitBltSrcCopy(), DIB_8BPP_GetPixel(), DIB_8BPP_HLine(), DIB_8BPP_PutPixel(), DIB_8BPP_TransparentBlt(), DIB_8BPP_VLine(), IntEngEnter(), and UnsafeGetBitmapBits(). Definition at line 1209 of file winddi.h. Referenced by BITMAP_CopyBitmap(), BITMAP_GetObject(), DIB_16BPP_TransparentBlt(), DIB_1BPP_BitBlt(), DIB_24BPP_BitBlt(), DIB_24BPP_TransparentBlt(), DIB_32BPP_TransparentBlt(), DIB_4BPP_BitBlt(), DIB_8BPP_TransparentBlt(), DIB_XXBPP_StretchBlt(), GreGetDIBitsInternal(), GreStretchBltMask(), IntEngBitBlt(), IntEngEnter(), IntEngLeave(), IntEngLineTo(), IntSetDIBits(), NtGdiExtFloodFill(), NtGdiGetBitmapBits(), NtGdiGetPixel(), NtGdiSelectBitmap(), SpiSetWallpaper(), UnsafeGetBitmapBits(), and UserDrawIconEx().